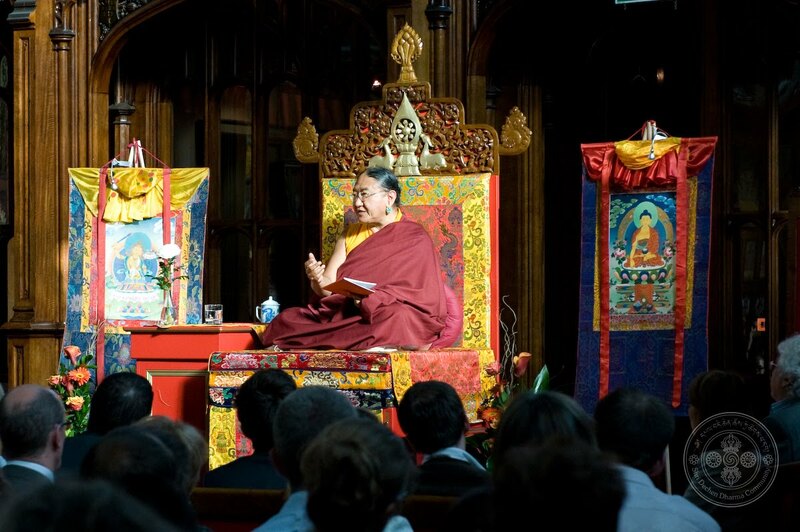 This past week saw the ninth visit of His Holiness Sakya Trizin to our dharma community. His Holiness was hosted by Lama Jampa Thaye, Dechen Dolma and Sakya Dechen Ling for a total of five days in London. At the request of Lama Jampa Thaye, His Holiness bestowed the initiation of Shri Kalachakra and gave a public teaching on the Zhenpa Zhidral. The visit began at the Sakya Dechen Ling centre in Notting Hill on Sunday, 13 June where His Holiness and entourage were received by Lama Jampa Thaye, Dechen Dolma and a number of sangha members. Lama Jampa offered His Holiness a mandal tensum for His long life. Due to an auspicious coincidence, the new 43 volume collection of Lamdre texts had arrived at the centre the previous day and His Holiness kindly acceeded to Lama Jampa's request that He bless the texts. Later that same day the first public event of the visit took place in the spectacular surroundings of the Great Hall at Lincoln's Inn in Central London. 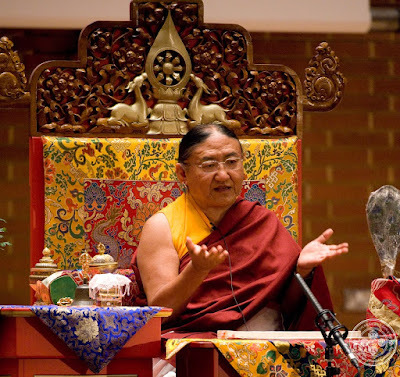 His Holiness gave a peerless exposition of the Zhenpa Zhidral via Jetsun Drakpa Gyaltsen's commentary on the fundamental Sakya text, originally received by the Great Lama Sakyapa from the bodhisattva Manjushri. 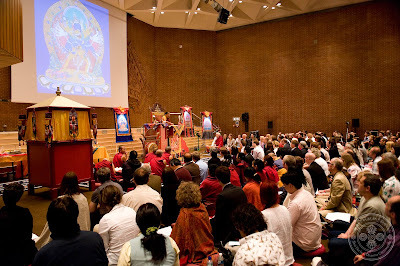 Monday, 14 and Tuesday, 15 June saw His Holiness bestow the initiation of Shri Kalachakra at the Kensington Town Hall. Lama Jampa Thaye, Lama Ole Nydahl and a vast assembly of monks and nuns, laymen and women came together on this joyous occasion to receive the initiation. Sangha members came from a number of different dharma communities, including Sakya Thubten Ling, Sakya Ling, the Diamond Way, the Foundation for the Preservation of the Mahayana Tradition and Rigpa. The conclusion of the initiation saw Lampa Jampa give a short speech rejoicing in the visit of His Holiness and praying for His Holiness' long life. The fourth day of the visit saw filming of a question and answer session with His Holiness at a recording studio in Notting Hill. His Holiness kindly answered a number of questions on dharma topics, including the bardo, His root lamas and the connections between the Nyingma and Sakya traditions. Footage of the question and answer session will be released shortly on a dedicated YouTube channel. His Holiness' visit concluded on Thursday, 17 June. His Holiness and entourage flew on to the Netherlands, where He will visit Sakya Thegchen Ling and bestow the initiation and tri of White Tara. The visit of His Holiness Sakya Trizin was an awesome reminder of the great blessings of our Gentle Lord, the greatest Vajrayana master alive today, and of the vitality of the glorious Sakya tradition. 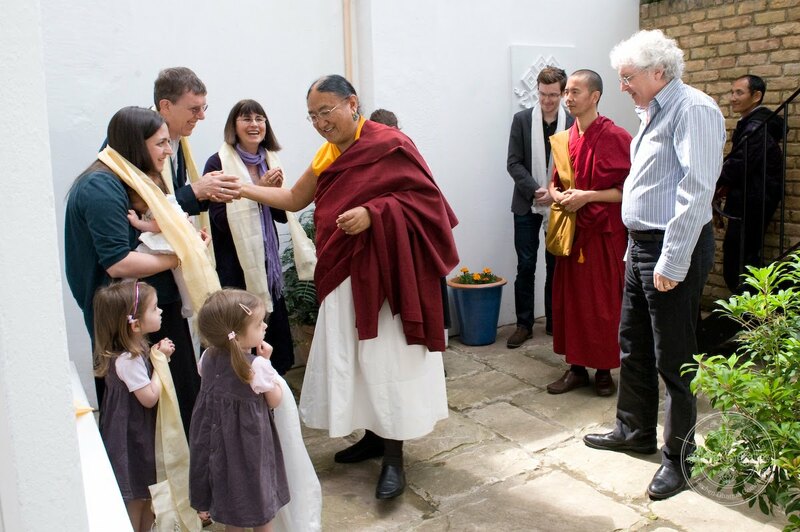 Click here to register with the Dechen blog and receive updates on the soon to be released DVD of His Holiness' teaching at Lincoln's Inn and further pictures from the visit.